The big, two-story pavilion contained an endless variety of displays under the theme transportation. Its exhibitors included airlines and steamship lines, railroads and trucking companies, travel agencies and tourist resorts, and the United States Army, Navy and Air Force. At one end, it featured an enormous 96 foot high Moon Dome whose plastic cover formed an accurate relief map of the moon. Aerial view of the Transportation and Travel pavilion. Exhibits included a Hall of Fame for pioneers of the transportation industry, custom made automobiles, transportation equipment and maps and models of all kinds. In one of several theaters United Airlines showed a seven minute film that demonstrated the wonders of jet flight. The Navy sponsored a film "Around the World with the Navy". It showed an atomic submarine cruising under Arctic ice, jets operating from an aircraft carrier and aerial acrobatics performed by the Navy's "Blue Angels" precision flying team. Exterior exhibits at the Transportation pavilion. In the show "Under the Sea" skin divers in a huge tank put on an underwater drama. Lloyd Bridges, the star of the TV show Sea Hunt narrated the show on tape. "The World of Ancient Gold" featured the largest collection of gold artifacts and ceremonial pieces of pre-Columbian Indians ever assembled. It included 400 pieces and was valued at over $3,000,000. 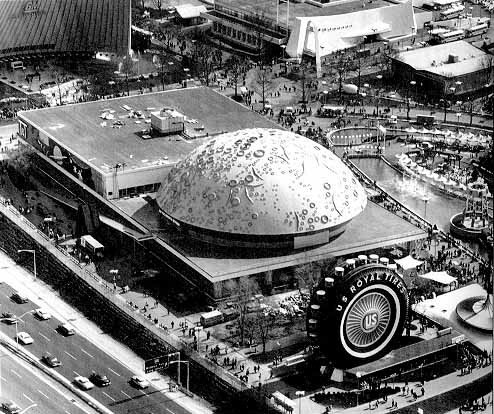 Inside the Moon Dome, a color film made by Cinerama was projected on a concave screen that encircled the audience. The 18 minute film took the viewer from the infinite reaches of outer space into the nucleus of the atom. 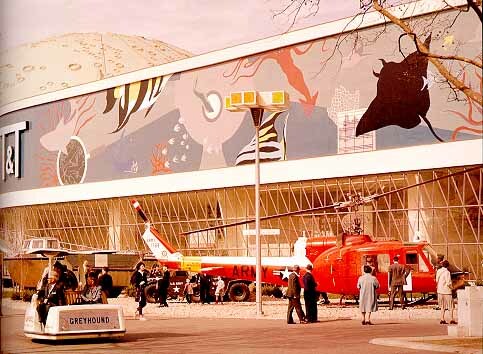 Admission to the pavilion was free, but it cost 75 cents to the Sea Hunt, Moon Dome and Indian gold exhibit; 75 cents to the custom car exhibits; 25 cents children.